ARVIND SWAMINATHAN writes from Madras: As if to prove the old adage that blood is thicker than water, there have been four rounds of internecine strife in the last 22 years in the undivided Hindu family that owns and runs India’s “most respected” newspaper. To no one’s surprise, Narasimhan Ram aka N. Ram, the card-carrying Marxist who drove CPI (M) strongman E.M.S. Namboodiripad around town, and was a college mate of current CPI(M) general secretary Prakash Karat, has been the central figure in all four of them. Equally unsurprisingly, the warring parties in the first round have found themselves on the same side of the war in the next three skirmishes. The war: Uncharacteristically, The Hindu which prides itself as a “newspaper of record”, goes ballistic about the Bofors scandal, thanks to Chitra Subramaniam, who has hopped over to the paper from The Indian Express, carrying the Bofors legacy. Chitra and N. Ram, then no.2 in the editorial hierarchy, do a number of jointly bylined stories. In October 1989, The Hindu publishes the first part of a three-page article with the promise “To be continued”. At a press conference, Ram also freely distributes the unpublished second-part of the Bofors investigation, with all the relevant documents, and invites newspapers to carry it. Ram also approaches the Press Council of India with a 15-page complaint against G. Kasturi. The war: Against the backdrop of complaints that the paper was veering far too much to the left and alienating “loyal” readers with its anti-Jayalalitha and anti-Hindu stance, the board of directors of Kasturi & Sons passes a resolution appointing whole-time director N. Ram (till then editor of Frontline and Sportstar) as editor-in-chief of The Hindu, placing him over editor N. Ravi. 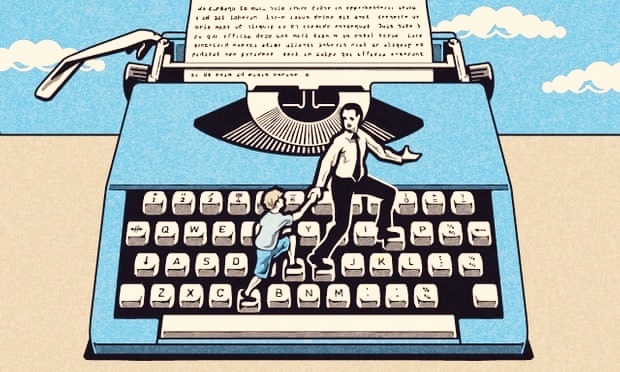 “It is true that our readers have been complaining that some of our reports are partial and lack objectivity. But it also depends on reader beliefs,” joint managing director N. Murali, the brother of N. Ram and N. Ravi, is quoted as saying. Ram takes charge, promising to keep news and opinion separate. The fallout: Ram presides over the 125th anniversary, with neither Ravi nor Malini in the frame. In November 2003, the Tamil Nadu government turns The Hindu into a cause celebre by ordering the arrest of the publisher of The Hindu, S. Rangarajan, journalists V. Jayanth and Radha Venkatesan, and N. Ravi and Malini Parthasarathy for breach of privilege of the assembly for articles that had appeared in April of that year. Although they continued to be editor and executive editor respectively, neither Ravi nor Malini write for several years. The war: The two aggrieved brothers of N. Ram say he reneged on a September 2009 promise to retire by May 2010 upon turning 65, thus paving the way for N. Ravi to take over as editor-in-chief. But it is the appointment of family members—N. Ram’s daughter Vidya Ram, Nirmala Lakshman’s son Narayan Lakshman, and Nirmala’s (and Malini’s) sister Nalini Krishnan‘s son Ananth Krishnan—as foreign correspondents that has most tongues wagging. The fallout: Ram makes public the decisions taken by the board in a front-page announcement. The issue goes to the company law board (CLB), which in December 2010 orders the reinstatement of N. Murali as managing director but declines to interfere with new appointments made, including that of K. Balaji as managing director, or to implement a retirement age for family members on the company’s board. The war: Less than a month before he is to demit office upon turning 65, Ram breaks with tradition and announces that the board has decided to appoint a “professional editor” who will be responsible for selection of news under the PRB act. This, he adds, is to happen when N. Ram steps down as editor-in- chief and N. Ravi steps down as editor. “The other directors working on the editorial side would also step down from their current editorial designations in such time as the board may decide and become part of a committee of the board of directors known as the editorial board,” the board decides in a 7-5 decision. Ravi also accuses Ram of going soft on 2G scam accused A. Raja, of hogging the limelight in an “unceasing self-glorification campaign”, and a pronounced pro-China tilt. Ravi’s contention that there was quid pro quo amounting to paid news in an interview with A. Raja in exchange for an advertisment is shot down by Ram at a press conference in Delhi, where he calls the charge “egregariously defamatory“. The fallout: The dispute is likely to go to court. Malini Parthasarathy tweets: “After me the deluge”! Real story at The Hindu is the removal of a sitting Editor and continuing backdoor control of editorial by proxies.” N. Murali, who is away in the United States, says that the attempt to alter the basic structure of the business should be passed with a three-fourths majority by the EGM on May 20. This is depressing. I hope I’ll still be able to enjoy The Hindu, for years to come. 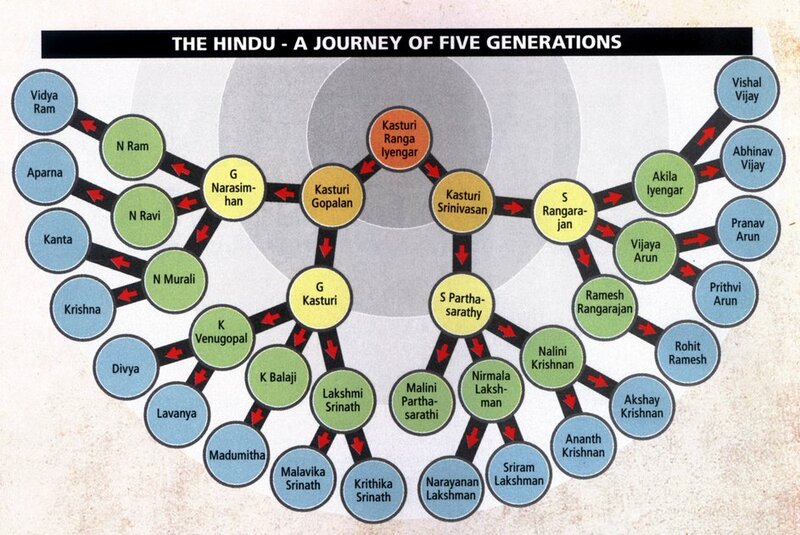 I shudder to think what will happen if The Hindu goes the IE way and launches ‘The New Hindu’! There is no gainsaying the fact that The Hindu has lost its glory and credibility.This has resulted in large number of readers switching over to TOI ,Deccan Chronicle etc.This steep fall in image has been the outcome of political leaning of M.D.impacting editorial policies.Why the Board has not arrested the trend in time — is a puzzling question.The Directors have a responsibilty to uphold the credibility and neutrality of the institution built over four generations.May be the Chinese proverb that a family run organisation can be sustained only for three generations is proved right.Ram might want this to happen with his leftist (pro-Chinese)bent of mind. A small factual inconsistency: According to the first line of the “third mahayudh” N.Ram would have attained age 65 years as of May 2010. In the “fourth mahayudh” the article says he will attain 65 years of age in May 2011. Correct: N.Ram is 65 years of age as of May 2010. Let us hope that the 4th Mahayuddha causes the cHindu to fall a mighty fall. If Ram does manage to insinuate Sid Varadarajan into the editor’s chair it may mark the beginning of the end for the newspaper and its stablemate – the lotus eaters’ den Frontline. Then it may be up to the two apolitical journals BL and SS to right a sinking ship, which in the increasingly difficult media market may be all but impossible. Ram is to The Hindu what Steve Ballmer is to Microsoft. A brusque, opinionated and sanctimonious hypocrite. And both of them have been sailing their respective ships aground. Wonder if Sid Varadarajan will be the lone Ram flunky in the editor’s chambers, or will be accompanied by other worthless ones such as AG Noorani, Vidya Subs, Sukumar Muralidharan and other notables. As far as we know, he is a legal luminary. This luks like Pandava and Gourawa’s tug of war… its highly unfortunate tat a family of their stature are facing the court today… this is a daily not jus for their family ut to the entire TN’s readers.. our family are reading this paper for generations now… we dont want any outsiders spoil the reputation and the standard and ethics and morale of the company as readers. hindu has beeen a paper for the dignified for decades now… we want them to unite and work in the already existing format which has given the organisation and the family a pride.only for ther unity soo long The Hindu has been extremely going in gud guns all through without problems.. we wonder why these directors and editor in chief want to spoil the reputation of the family and current structure??? i am sure the employees of the organisation would also accept my views. EGO between the family members should not spoil the organisation and its reputation. What is the position of Siddharth Varadarajan now? Is he officially the Editor of The Hindu? I do not recall any formal announcement in the paper about this. 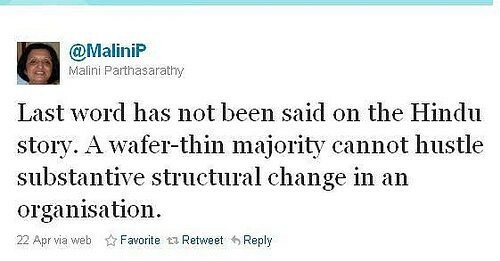 Is Varadarajan still functioning from Delhi, or has he moved to Chennai? One more question: is N Ram retiring at all; if so, when? I ENJOYED READING ‘THE HINDU ‘ THANKS TO THE PEOPLE BEHIND THE DAILY. HOPE IT CONTINUES TO BE SO. 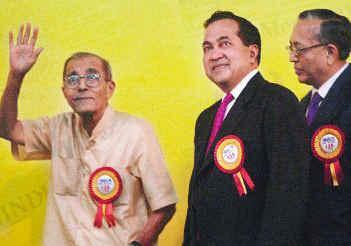 N Ram should be proud to be one and only non Sri-lankan award winner by the hands of the great mahathma Rajapakse. Accidentally came to this site and am happy i did.And unhappy too having been groomed by the Hindu from 1965 and no day started without Hindu and degree coffee and when there was a paper holiday used to read the earlier day’s paper!! Conditioned was the mind by Hindu , the paper not religion. Death of an individual how wver mightyi can accept not dilution of values in an institution. Sid V the new editor showed his priorities by headlining what happened in jaipur’s writers conference than burning issues. Ailing Rajesh Khanna’s death takes front page space over other events….If a sports lover in the Hindu family takes over editor ship it will be all sports than sportsmanspirit and if it is cash than content minded person , it will be 99 percent ads and one percent selective news in Hindu. Why only Monday Plus alone? To get more ad revenue it can be Tuesday Plus, Wednesday Plus and so on…. All Good Things Will Come To An End. I hope this will not happen to The Hindu in my life time! Now it is October 2013. Sid Varadrajan has arrived and entrenched. The Hindu has become more like the Times of India. Interesting article on the Wars in The Hindu. Now that the 5th (Sid V’s ouster) and 6th (Malini’s takeover) Wars are done, Malini Parthasarathy is steering the newspaper towards a pro-Corporate and pro-BJP path.